See scan - almost perfect condition for this kind of piece. This is a scarce late 18th century German Royal snuff box / case made out of soft grey metal - probably tin or lead. measures 50 x 30 mm. 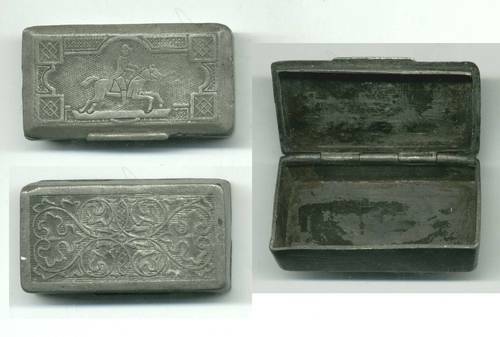 The box has its lid engraved and pictures a horse and a horseman riding and the bottom is engaved with floral motifs. Scarce and extremely rare piece. True collector item.